Colors: Dark and light brown, cream, red, gray, and white. 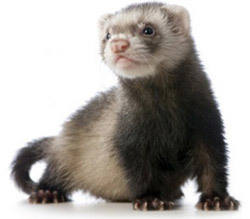 Ferrets have scent glands all over their bodies which secrete odors as a form of protection. Their haircoat is shiny and thick. 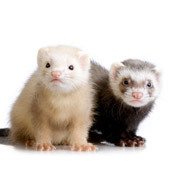 Ferrets have guard hairs which are longer and rougher, and an undercoat which is softer and usually a different color than the guard hairs. Their coats come in many different patterns and colors. Colors include dark and light brown, cream, red, gray, and white. The most popular coloration is the sable which looks similar to a racoon, having a "mask" that is a band or a V shape across their eyes. 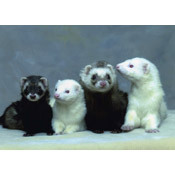 Ferrets are very sociable creatures and love to be part of a group. They will usually get along with any other ferrets - whether they be female or male. The only exception to this is un-neutered males. If males are not neutered they will often fight with each other during breeding season, and this should be avoided by not putting un-neutered males together. They are also great companions for many of the other household members including humans, dogs, and cats. Ferrets love to play and romp with them. Ferrets should only be bred by experts as its not easy tending to expectant mothers, dealing with birth and death and then taking the time to raise the kits with the help of the mum. Even the ferret house used needs to be kit proof as they are very very small and it should be kept warm using heat pads. Also the mother and babies need to be kept separate from any other ferrets you have and only be handled by one main carer. Males come into sexual peak between March and April, he will remain in this state until the end of summer. Females must be in a fit and healthy condition before they reproduce otherwise there could be problems during pregnancy. Once a Jill is on heat she must be mated to get her out of this state.